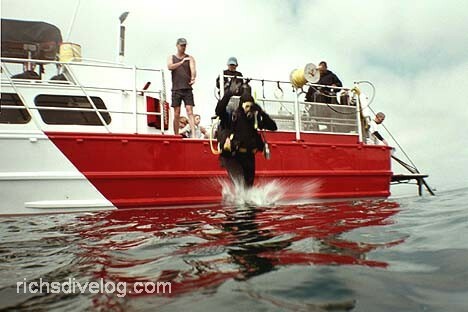 Dive Journal: Our third and last dive of the day is off the east facing slopes of South Island. As pictured at the left, there is a natural cove there with a very shallow opening at the back. Despite her best efforts, Linda can't seem to struggle back into her wetsuit, and so she elects to skip this dive. I am cold, but I find that during our descent, my coldness seems to fade away. We see an excellent mixture of wrasses, garibaldi fish, and basses. There is a 4 foot long moray eel at one spot - pretty cool. The three of us patrol down the southward wall of the cove, proceeding slowly toward the back. Pretty soon, the surge starts feeling rather strong. When a couple of large waves send us reeling, we scatter and get separated while finning back into the deeper sections. Everyone on the boat saw sea lions here except us. I was plenty cold on exit, but was warmed up again in a couple of hours.